Sam Hankins had the great fortune to be born into a musical family that would help cultivate his own talent and ambitions. 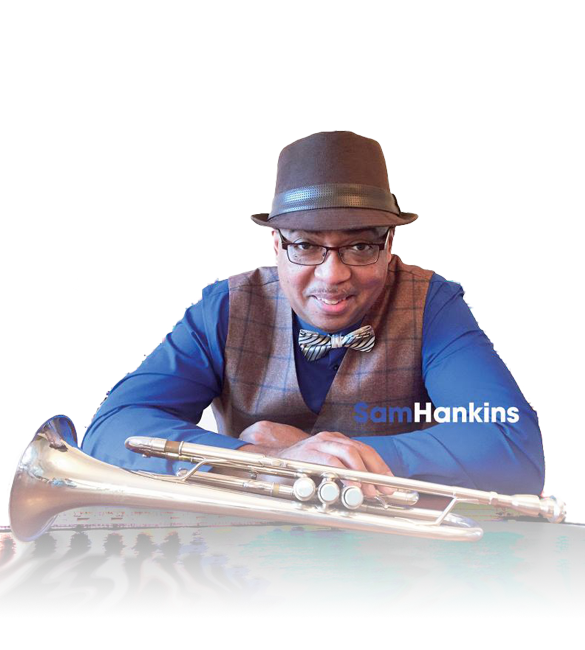 Encouraged by his father, Samuel Hankins Sr., young “Hank”” began with the guitar, then switched to his trademark trumpet in middle school and began playing in churches, professional bands and orchestras. Hankins remembers clearly being one of only 5 African American kids being bussed to the predominantly white Harmony Elementary School in Oklahoma City, which he attended with his younger brother. Music was a safe haven for Hankins who had difficulty concentrating in school and remembers clearly one of the teachers telling him that “he would never amount to anything”. However, he was determined to prove her wrong and went on to earn his Bachelor’s Degree in Music Performance from Northeastern State University in Tahlequah, Oklahoma. He then joined the air force jazz band, The Pacesetters, stationed at Chanute Air Force Base in Rantoul, Illinois as a trumpeter, where he remained until the Air Force Base closed in 1991. Hankins then returned to school, earning both a second Bachelors Degree and a Masters Degree in Music Education from the University of Illinois at Urbana-Champaign. It was while studying for his Masters degree that he found out he was dyslexic after being tested by his college professor. During his tenure as Band Director at the Edison Middle School in Champaign, Hankins won numerous teaching awards when he led a struggling band program to Division I ratings, State and National awards and recognitions. In 1997, he won the Golden Apple Award recognizing commitment to excellence in education & in 1998 received the White House Letter recognizing the Edison Middle School Band Program, sign by Hillary Rodham Clinton. Before becoming a solo artist Hankins performed with numerous legendary artists, including Al Jarreau, Clark Terry, The O’Jays, The Temptations, The Dells, The Impressions, Aretha Franklin and the Glenn Miller Big Band. A prolific composer, Hankins had composed over 150 pieces before he took his wife’s advice and began pursuing the next phase of his diverse career, as a solo recording artist. He laid the groundwork for Nothing Between Us (May 2012) by releasing Dream Catcher (July 2011), a compilation of his catalog of music in every genre from smooth jazz and dance to techno. He released his third CD, Joyous Celebration, a Christmas CD which is a collaboration with David McLorren in November 2015. His latest CD, Do That Thang was released in March 2016. All 4 CD’s have received lots of radio play in the US & around the world and have won over 25 independent music awards. Hankins is currently the Band Director at Rich East High School in Park Forest, a Chicago suburb, as well as an Adjunct Music Professor at South Suburban College where he is the Director and Conductor of the Jazz Combo and Jazz Ensemble. On April 23rd, 2017, Hankins won 9 independent artist awards at the Indie Music Channel Awards (IMC) ceremony in Hollywood. Thousands of independent musicians from all over the world (Australia, Europe, UK, Canada & Nigeria, to name a few) submit their music in the different genres to be judged by music industry professionals (well known producers, managers, radio DJs, songwriters, etc). The list of nominees is released in March and the awards show is held in April in West Hollywood every year. This year it was held at the famous Troubadour, which has seen performers such as Miles Davis, Elton John & Bob Dylan, amongst others. Rich East High School Band Director wins 9 independent artist music awards in Hollywood. All Rights Reserved - Peboga Productions | Designed by Canaan Media Solutions.